Village – Usmanwala, District Ferozpur. The Indian government had put a reward of 25,000 rupees on the capture of Bhai Sukhwant Singh Usmanwala and Bhai Balwinder Singh Basarke. The 20th century army general of Sikhs, Sant Jarnail Singh Ji Bhindranwale started a struggle for the freedom of Sikhs and in this struggle many thousands of Sikhs attained shaheedi fighting the oppressing Indian government. In the army of fearless Sikh warriors are two shaheed singhs from the village of Usmanwala, Shaheed Bhai Gurdev Singh Usmanwala and Shaheed Bhai Sukhwant Singh Usmanwala. The whole encounter started at 4pm and for two hours an intense battle took place between the two sons of Guru Gobind Singh Ji and thousands of paid CRP officers. When the singhs finished all their bullets, they made their mind up on not getting caught by the police alive and swallowed capsules of Sy-Nyde each to attained shaheedi. The battle started at 4pm and finished at 6pm on the 6th of February 1989. Bhai Sukhwant Singh Usmanwala was born in the house of Sardar Kartar Singh and from the womb of Mata Surjit Kaur on 17th December 1959 in the village of Usmanwala, district Ferozpur. Sardar Kartar Singh was a hard working farmer and had five sons Bhai Bageecha Singh, Bhai Ajit Singh, Bhai Sukhchain Singh, Bhai Sukhwant Singh and Bhai Randhir Singh. Bhai Sahib passed his 10th class from the government high school of village Arifke with great results. As Bhai Sahib was cousin of Bhai Gurdev Singh Usmanwala, the Punjab police would harass the whole family and relatives. The Khadku Singh would also come to Bhai Sahib’s house for langar and rest. The family soon moved to Rajasthan from Usmanwala village, to avoid the harassment of the Punjab police. Bhai Gurnam Singh Bandala would regularly visit Bhai Sahib in Rajasthan, as both singhs were very close friends. Bhai Sahib later came to Gurudwara Gurdarshan Parkash, Chownk Mehta to do Gurbani Santhaya. Once Bhai Sahib completed his Gurbani Santhaya, he went back home and the Khadku Singhs started to come and have langar at his family house in Rajasthan. Within the Sikh Freedom Movement, Bhai Sahib was known as Bhai Gurtej Singh. The police was soon informed that Bhai Sahib was helping the Khadku Singhs and wanted to arrest him, but Bhai Sahib had gone underground and lived with the Khadku Singhs. The Punjab police were taking their anger out on Bhai Sahib’s family. The police put fake cases on Bhai Sahib’s younger brother, Bhai Randhir Singh and locked him up Nabha jail for 7 months then in Ferozpur jail for 13 months and soon the courts dropped all cases against Bhai Randhir Singh and was released in 1984. By now Bhai Sahib had become a top armed Khadku Singh. “Khalistan Zindabaad, Khalistan Commando Force Zindabaad”. The singhs then moved into the fields, so the local innocent families would not get hurt in the crossfire. The CRP contacted their headquarters through the wireless and called for more reinforcements. The whole encounter started at 4pm and for two hours an intense battle took place between the two sons of Guru Gobind Singh Ji and thousands of paid CRP officers. When the singhs finished all their bullets, they made their mind up on not getting caught by the police alive and swallowed capsules of Sy-Nyde each to attained shaheedi. The battle started at 4pm and finished at 6pm on the 6th of February 1989. The Indian security forces showed their bravery by firing bullets into the dead bodies of these singhs. The following day on 7th February 1989, the main headline on the radios and newspapers was that Punjab police and the CRP have killed two Khalistan Commando Force extremist in an intense encounter in the village of Ruknewala, near the Mallanwala police station. The Indian government had put a reward of 25,000 rupees on the capture of Bhai Sukhwant Singh Usmanwala and Bhai Balwinder Singh Basarke. Two AK47 assault rifles were found at the scene of the encounter. The Punjab police wanted these two singhs for many murder cases and on many occasions these singhs also attacked the bases of Indian security forces. Bhai Sukhwant Singh Usmanwala was the relative of another Sikh Khadku Singh, Bhai Gurdev Singh Usmanwala. The sarpanch of Usmanwala, Bhai Mahal Singh approached the police of Mallanwala police station and found out that the bodies of Shaheed Bhai Sukhwant Singh Usmanwala and Shaheed Bhai Balwinder Singh Basarke had been sent to the local hospital for post mortem. After the post mortem the family was given the body of Bhai Sahib and under the watchful eye of the Punjab police the cremation was performed in the village of Usmanwala, at the location of the cremation now stands a gurudwara in memory of Shaheed Bhai Sukhwant Singh Usmanwala and Shaheed Bhai Gurdev Singh Usmanwala. The police cremated the body of Shaheed Bhai Balwinder Singh Basarke themselves. 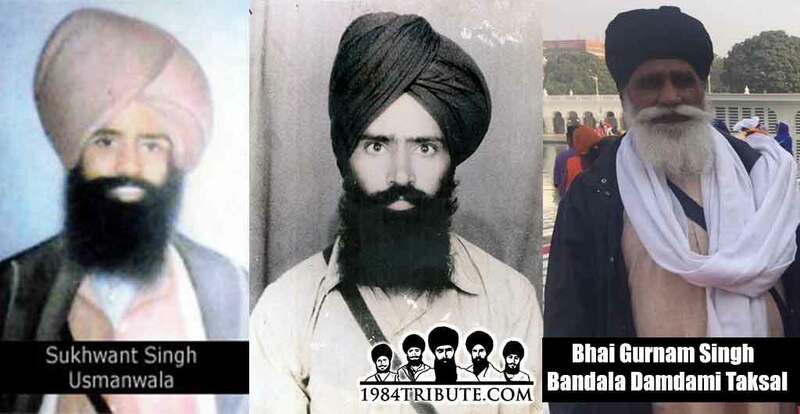 Sri Akhand Paath Sahibs was held in memory of Shaheed Bhai Sukhwant Singh Usmanwala and Shaheed Bhai Balwinder Singh Basarke and the bhog was done on 16th February 1989. At this time Bhai Sahib’s younger brother, Bhai Randhir Singh was in the police custody. A gurudwara has been built in memory of these shaheeds of Usmanwala to remind the Sikh panth of the sacrifice of these shaheeds. 27th July 1989, according to a newspaper article headlined, Ferozpur ton Baagi, the Punjab police has arrested a dangerous Khadku Singh by the name of Bhai Randhir Singh Dhira. He was a mastermind in some of the actions done by Khadku Singhs in the Ferozpur district. SSP Goyal said, “The same Khadku Singh attacked the police base near the Sadar police station on the night of 26th July 1989 at 9.40pm. The police returned fire and managed to arrest Bhai Randhir Singh Dhira of Usmanwala village. There was a reward on his head for 25,000 rupees. He was member of Bhai Gurnam Singh Bandala’s Khalistan Commando Force. The police found bomb making equipment and an Ak47 on him along with 50 mags”. SSP Goyal also stated that Bhai Randhir Singh Dhira was the oldest companion of Bhai Gurnam Singh Bandala. He was also related to another class A Khadku Singh, Bhai Gurdev Singh Usmanwala and was the blood brother of a Khadku Singh, Bhai Sukhwant Singh Usmanwala both were part of Khalistan Commando Force also. Bhai Sukhwant Singh Usmanwala has been killed in an encounter with the CRP, he had been working under Bhai Gurnam Singh Bandala and Bhai Nishan Singh.